Capital City of Dhaka outskirts sees hundreds trapped beneath the collapsed which contained shops and a clothing factory building. 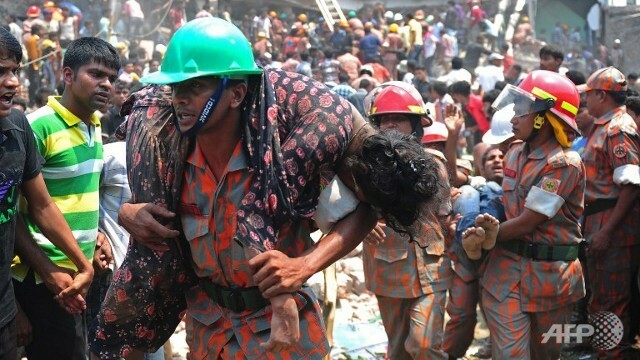 Bangladesh’s capital Dhaka on the outskirt in a suburb called Savar, Wednesday 24th April was a scene of concern with a building collapse which has seen at least 200 people injured and hundreds unaccounted for. There are rescue efforts underway to save the people who are trapped beneath the debris. The building was an eight storey, which contained a clothing factory, shops, and a bank. The collapse occurred during the morning rush hour and there are concrete cutters and cranes being used in hope to reach any of the hundreds of possible survivors under the rubble. The army too are involved in the desperate rescue effort, whilst family and friends are standing by in hope of people being found, some even helping with their bare hands to remove the remains of the building. This is a disaster which is unfortunately common within Bangladesh, where building collapses are frequent due to violated building rules. India also saw a building collapse on the 4th April where 74 was the death toll the worst building collapse in Maharashtra’s history. Lessons should have been learnt from the afore mentioned disaster, when a crack in the Bangladeshi building was noticed on the Tuesday as the local media is reporting, which should have raised the alarm as to the danger of a collapse; the death toll in Savar is currently 238. 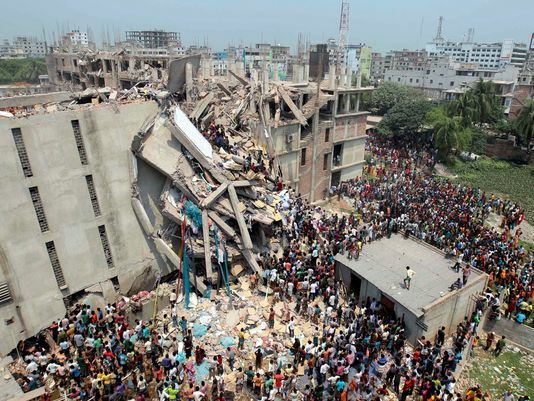 It has emerged that Primark, Matalan and Mango had clothes made for them by companies who were in the process of having samples made within the Rana Complex which collapsed, although Mango says they were in the sampling part of the process. The unfortunate story has unfolded further with the disappearance of a local politician who built the building, which was authorised by the Mayor’s office, which is said to have been against safety procedures as Rajuk the agency in charge of construction safety in the area should have been the one to issue any permit. Protesting has begun seeing clashes with police after the building collapse, the protests are down to the unsafe and poor standards of health and safety. Hundreds have been said to have protested in an effort to make authorities and the companies involved, come alive to the genuine danger that the workers face everyday. There have been many dead bodies and some survivors to emerge from the collapse and they have been taken to the hospital which has seen its resources stretched to the full. Many will be hoping to see more survivors emerge.